Mazzi and Erez Peled's handmade "geodes" give 3-minute colorful fizz shows, then set a mood for your soak. 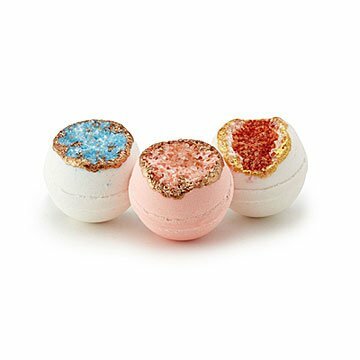 Each of these handmade luxury bath bombs is a doozy of a "druzy": they turn the water different colors and fizz and bubble for at least three minutes, then get to work soothing both mind and body. Mazzi and Erez Peled blend carefully chosen colors and scents to create a specific, inspiring mood for each soak, then paint every beautiful "geode" by hand with an artist's touch. Step in the water and enjoy the colorful, scented effervescence. Then let the plant-based butters and oils soften your skin as inspiration crystalizes your mind. Certified cruelty-free by PETA. Handmade in Austin, Texas Contains nut ingredients. To enjoy your bath bomb: Unwrap your bath bomb. We shrink wrap our bath bombs to maintain freshness. Fill your bath tub at least 3/4 full with warm water Place your bath bomb in the water Enjoy the fizzing bubbles, the scent, color and extra moisturizing butters and oils. When you are done, rinse your tub with water. Great product and is gorgeous!